A 5-year-old girl’s dreams are filled with wonder. Whether it’s playing princess or doctor, your daughter is playing with different roles. She is enjoying making her own stories and loves is when others take part in them too. Buying a gift for a girl at this age can seem daunting if you want to go beyond dolls and make-up sets. While she would enjoy those toys, choices that expand her world can nurture her curiosity in a variety of ways. Why not encourage her imagination and give her more wonderful stories? These are 20 toy ideas that can cultivate wonder in your daughter. She can be a star in many types of stories. Expand her world a little. It may give her room to discover that there are many more types of stories to tell. If your child has wanted a pet, here is a low maintenance option for you. 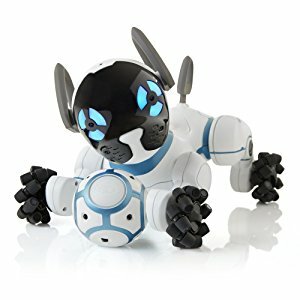 WowWeeCHiP Robot Dog has many dog-like behaviors without the mess and responsibility of a real dog. Even better, CHiP’s personality will grow over time like a real pet. This robot dog possesses an AI algorithm that reacts to the things around him. An array of sensors send the data to his processor so that he can speak, move, and react to your daughter and the environment. This is also possible because of an array of Smart tools that come with CHiP. A SmartBand allows CHiP to recognize your child as his owner. It looks like a smartwatch with simple pictures to signify the button use. When your daughter wears the SmartBand, CHiP will be able to greet, follow, and play with her just like a real puppy. She will even be able to play fetch with CHiP using the SmartBall that is included. The ball has sensors that talk to CHiP’s sensors, allowing for the robot dog to find it. CHiP even comes with a SmartBed that is his charging dock. He will make his way to it when he is low on power. What’s Great About It – Your daughter can experience the affection of a canine playmate without the mess of owning a real puppy. She will still have responsibilities, but they will be different from real pet ownership. Her new chores may include making sure her SmartBand is charged nightly, or picking up CHiP or the SmartBall. Playing with the robot dog will get her physically active, while her imagination can take flight as she makes her robot friend a real part of the family. This is a ride-on toy, but it has a unique twist. 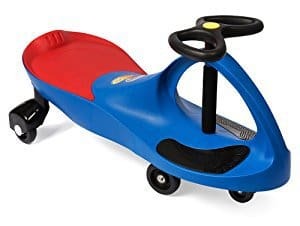 With the Original PlasmaCar by PlaSmart, your daughter only needs to sit down on the sleek car, put her feet up, and use the steering wheel to start moving. No peddling or pushing is needed. The PlasmaCar can be used inside or outdoors, and is slender enough to maneuver around corners and smaller spaces. If the ground is smooth, she can ride over it. The PlasmaCar uses the principles of inertia, centrifugal force, gravity, and friction to get moving and stay in motion. The PlasmaCar is safety certified in the U.S., Canada, and Europe. It can reach speeds up to 6 mph, so if that is a concern, you can also put a helmet and pads on your child before she gets going. It is even adult friendly and supports up to 220 pounds in case you want to “test” it out for yourself. What’s Great About It – The PlasmaCar is a multi-award-winning way to stay active. Your daughter will use her balance, coordination, and a bit of stamina to start zipping around. It also comes in multiple colors so that you can pick out her favorite. If your daughter has access to an iPad, this gift turns it into a great hands-on learning tool. 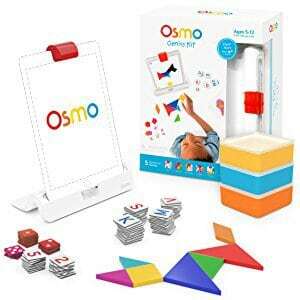 The Osmo Genius Kit comes with 5 games designed to promote different aspects of her development. It is designed to adjust to a child aged 5 to 12-year’s skill level, so it takes some of the guess work out about whether it may be too easy or advanced for her. Drawing, math, spatial thinking, words, and creative problem solving are the focus of the 5 games that are included. While there are a few toys on the market that offer the same learning advantages, Osmo’s approach is unique. Using the front sensor on the iPad, the programs become tactile activities rather than mindless clicking and swiping on a tablet screen. If your daughter wants to use the drawing program (Masterpiece), she simply puts what she wants to draw in front of the iPad and it produces the image in simple lines for her to use. This game is tracing on another level. The other programs are a similar combination of physical and screen interaction. What’s Great About It – This is a great way to use a device that you may already have at home. Osmo makes learning with the iPad kinesthetically interactive. Some games can also be played with multiple players, so play mates can also use Osmo with her. One of the best aspects of this gift is that it is designed to adjust to your daughter’s skill level. This way, she will always be challenged just enough to keep her intrigued. Does your daughter like make-believe? This is a gift that may have your family coming back for seconds. 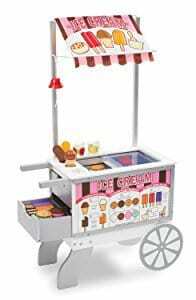 The Melissa & Doug Wooden Snacks and Sweets Food Cart will let her setup shop with her own hot dog and ice cream stand. The reversible awning lets her pick between an ice cream or hot dog cart. The cart is of wooden construction. It requires light assembly, but is durable. It comes complete with over 40 play pieces of food and a writable menu, so she can pick her prices. Don’t despair about keeping track of the food pieces. There are built-in storage drawers to put her toys away in when not in use. What’s Great About It – This is the perfect opportunity for many role-playing sessions. She can practice her communication skills by taking orders and her fine motor skills as she fills her orders. As she learns about money, she can practice counting out money and change according to her menu prices. Barbie has a place in many girls’ childhoods. This doll, however, may earn a special place in your daughter’s heart if she enjoys fantasy elements of make-believe. The Barbie Fairytale Dress Up Doll comes with 3 complete looks: princess, fairy, and mermaid. These complete character looks come with everything needed to turn her Barbie into her favorite fairytale character. Does she love princesses? She can dress her Barbie in the princess dress and tiara. Are mermaids more her thing? Barbie can be dressed up with a tail, fins, and swimsuit top. Or if she can’t get enough of fairies, your daughter can dress-up her doll in an airy dress and wings. If your child is feeling creative, she can mix and match the costume pieces to make hybrids of her own. A princess mermaid? A fairy princess? She is only limited by what she can imagine. What’s Great About It – One of the great things about this Barbie is that your child does not have to choose one theme for the doll. The different possibilities are the doll’s greatest appeal. 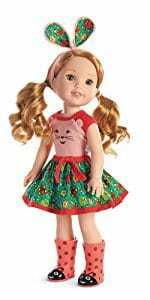 Your daughter will exercise her imagination as she dreams up new looks and stories for her fairytale doll. If your daughter likes pretending to run a store, or is fascinated when you pay at a register, this gift may be one to consider. Learning Resources Pretend & Play Calculator Cash Register is a great addition for play stores, or to begin teaching her about money. The Pretend & Play Register comes complete with life-sized pretend plastic US bills, coins, and a credit card. It has oversized buttons and a solar-powered LCD display screen. The calculator feature on the Play Register will help her learn and practice her math skills as she gives and makes change. The register also makes a “cha-ching” sound when the drawer is opened for full role-playing fun. It also comes with an activity guide for you to get ideas for when she gets tired of playing with it on her own. What’s Great About It – This gift can teach your daughter about money and basic math skills under the guise of one of the favorite childhood games: playing store. The plastic currency is more durable than paper play money, and the coins are real life sized. If she has seen or handled real money, these pieces will be more satisfying when playing make-believe. 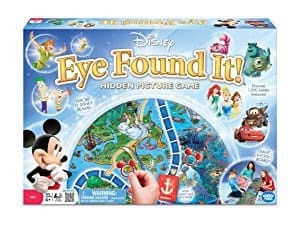 World of Disney Eye Found It Board Game is a combination of a hidden object and a matching game with a twist. Played on a 6-foot game board, your daughter will traverse 12 familiar Disney realms in a race to reach Cinderella’s castle in time. Playable with up to 6 players, this game features cooperative teamwork as opposed to one-on-one competition. Either everyone wins, or everyone loses. This concept works because it encourages all players to do their part in searching for the hidden objects to support the team. This is a timed game. It begins by setting the clock to 1:00. All players have until 12 midnight to reach the castle. Players advance through a series of actions like: move, tick the clock forward, or search. Actions are determined by a spinner. The search action is the center of the game. When the spinner touches on “search,” your daughter and fellow players will flip a Search Card over and look for the corresponding picture. Every item found moves all players forward. What’s Great About It – This game promotes cooperation and teamwork in a social setting. It will also allow your child to practice her matching skills and attention to details. The familiarity of Disney scenery and characters may keep her more engaged as she pores over this large gaming surface. Does your child like taking care of animals? Maybe she is fascinated with vets? If so, the Battat Vet Kit Clinic may be worth considering for your daughter. This Vet Kit comes with a stuffed Dalmatian puppy as her very first patient. 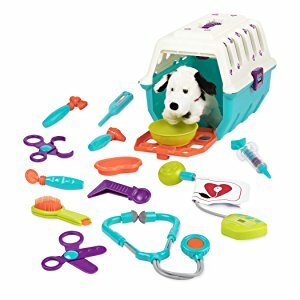 It also includes over 15 pretend vet tools and a small plastic dog crate to take care of her “patient.” All the pieces can be stored in the crate for an easy clean up. What’s Great About It – This toy makes a great choice because it fosters your child’s empathy for the outside world. It develops her nurturing side as she takes care of others. It can also be a trainer for eventually owning a real puppy. It’s also a great addition for play dates. Your daughter and her friends can take turns doctoring the toys. Help your daughter capture special moments with her own camera. 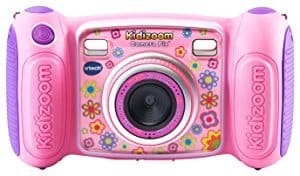 The VTechKidizoom Camera Pix is a camera just the right size for her little hands. She can express her own creativity by taking photos of scenes that fascinate her. This VTech camera has a real 2.0 MP camera and 4x digital zoom. She can even take selfies using selfie mode that auto-detects her face to snap the picture. This camera even has a video recorder and voice recorder modes. She can personalize her photos further by adding special static and animated effects to her photos just like you do on your cell phone. When she grows tired of recording life around her, she can play one of the 4 games built into the camera. The durable plastic makes it safe from drops and tumbles from small hands. It also has built-in memory with an expandable micro-SD slot. The photos can be downloaded onto a computer with a USB cord. Unfortunately, this VTech camera comes with neither a micro-SD card nor USB cord. It also does not have a flash, so all photos must be taken in well-lit conditions. What’s Great About It – Your daughter will be able to capture her own memorable moments with this gift. One of the other gifts that comes with this toy is independence to capture her creativity. She can choose what is important to take photos of and how she wants to capture it. If your daughter is a budding scientist, this microscope is worthy of consideration. 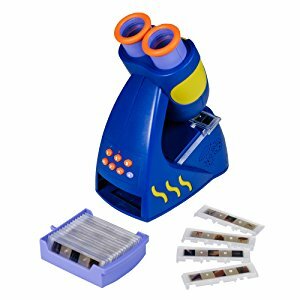 Education Insights GeoSafari Jr. Talking Microscope is a multi-lingual learning experience for any child with scientific curiosity. If your child is multi-lingual, audio tracks are available in English, Spanish, French, and German. The Talking Microscope is easier for young children to use with its dual eyepieces and 5x magnification. There are 20 realistic slides included with the microscope. She can learn fun facts about animals, plants, and every day household items. There are 2 modes on the Talking Microscope: Fact and Quiz. There are over 100 facts and questions for your child to discover. What’s Great About It – This voiced microscope makes it easier for your young daughter to learn about the world around her. It will also familiarize her with a microscope for later in her education. It can also spark further curiosity about the natural world. She will exercise her fine motor skills as she changes the slides. She can also practice processing information as Bindi Irwin tells her about each slide. Build & Imagine: Career Dolls take the idea of dress-up dolls and mix ‘n match outfits to a different level. If your child likes switching outfits on her dolls, you can imagine the stories she can dream up if she switched out careers instead. Career Dolls comes with 2 wooden dolls and 12 careers to choose from. 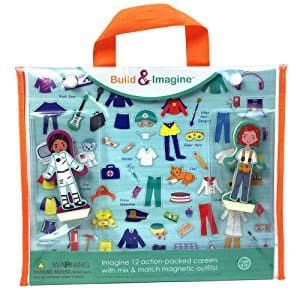 The careers have profession appropriate magnetic clothing and accessories that stick onto the standing wooden dolls. This set also comes with two magnetic scenes to use as a backdrop for your daughter’s make-believe time. All the pieces are packaged in a re-useable carrying case. Whether she wants to be a Rockstar, space explorer, or professional soccer player, these career choices will not limit her to gender specific stereotypes. What’s Great About It – These dolls expand her repertoire of role-playing options. While being a princess is great, there may be some days when she wants to be the President instead. Career Dolls will give her that option. It is also portable, so she can easily take it on trips or playdates. The dolls and accessories are made from wood which also make it more durable than the typical paper dress-up doll variety frequently found on the market. Does your daughter enjoy doing crafts? 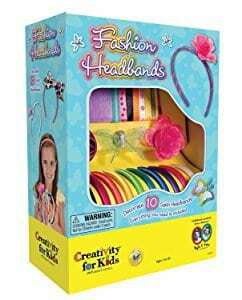 The Creativity for Kids Fashion Headbands Craft Kit is a great way for her to craft cute headbands for herself or for gifts. This would also make a great bonding project with an older adult since your child may need help or supervision with some of the steps. This Fashion Headbands Kit includes enough supplies to make 10 headbands. Your daughter can follow the directions that come with the kit, or let her own imagination take flight. It comes with a variety of accessories to personalize the headbands with, like: rhinestones, flowers, feathers, ribbons, and a butterfly. She can also use this kit during play dates, creating a headband crafting party with cool souvenirs for friends to take home. What’s Great About It – She can take pride in her wearable creations or make her own gifts for friends and family. Decorating headbands is easy enough for her level of dexterity, while still challenging her fine motor skills with smaller appliqués. She will practice color recognition and start to understand basic construction as she imagines how she would like to decorate her headband. Every princess needs a castle. 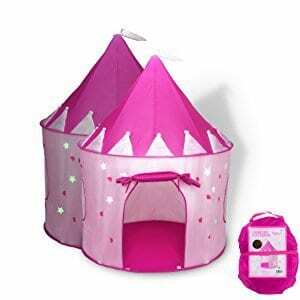 The Fox Print Princess Castle Play Tent with Glow in the Dark Stars is a great option to consider if you have a princess without a castle. Big enough to fit a couple of princesses, it’s also a great gift if your daughter enjoys sleepovers and playdates. The tent itself is of the pop-up variety. Additional poles are used for reinforcement. The glow in the dark stars on the tent is a nice feature. Sleepovers or backyard camping excursions will get an extra hint of magic when she overnights in her castle. The tent can be used inside or outdoors. It is lightweight and easily stored in its zip carry bag making this a very portable shelter option. What’s Great About It – This tent has a variety of uses. Your daughter can role play as a princess inside her castle, be an explorer under the stars, or simply use it as her own independent space. Since it is portable, lightweight, and can be used outdoors, your daughter also does not have to limit her imagination to just home play. 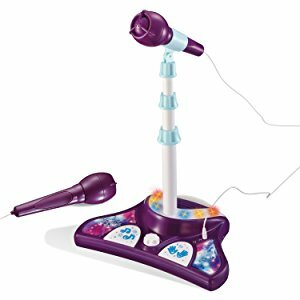 The Little Pretender Kids Karaoke Machine is a great gift if your child loves singing, or just pretending to be an entertainer. This entertainment system includes 2 microphones, 1 adjustable mic stand, and special stage effects. She can use the handle on the speaker and take her stage show on the road. Or stay stationary with the mic stand and stage effect pedals. Though Little Pretender Karaoke does not come with its own music, your daughter can still sing along with her favorite hits. Simply plug the included AUX cable into any device to play. What’s Great About It – Music and singing is very popular at this age. So is playing make-believe. This is a perfect blend of the two interests as your little girl can pretend to be an entertainer and put on shows for her family and friends. Performances can get her creative juices flowing and increase her own self-confidence. Some games are classic for a reason. 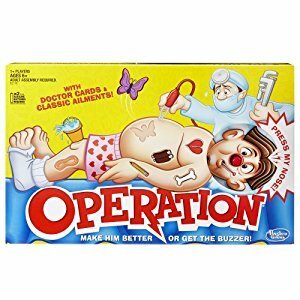 The Hasbro Classic Operation Game has many positive qualities that make this a gift worth consideration. Your daughter can still make-believe she is a surgeon, this time with silly results. The game consists of using tweezers to remove the patient’s ailments. If she or other players fail, a loud “buzz” sounds. She can play by herself or with friends. Patience and a steady hand are needed to successfully operate on Cavity Sam. What’s Great About It – It really is a silly game that may illicit a few giggles if she is playing with friends and family. That’s ok, though. Socializing is very important to your daughter at this age. Since she is supposed to be a doctor operating on a patient, the role-playing aspect will be familiar to her. She will also be exercising her fine motor skills as she attempts to operate. The award-winning American Girl WellieWishers Willa Doll is not your typical doll. What makes her stand out from others on the market is the attention to detail to give her a distinct personality. If your daughter absolutely must have a doll, you may want to consider this one. The WellieWisher series has dolls that are focused on friendship. Each doll also has a different passion. Willa loves animals. Her clothing reflects that love with ladybug, hedgehog, and bunny motifs. She is smaller than a regular American Girl doll, which make it easier for younger girls to carry her around. You can also buy additional clothing and accessories for the WellieWisher series including fantasy character outfits. Your daughter can eventually give Willa butterfly wings or turn her into a mermaid with these add-on purchases. It’s a great way to expand her creativity using the same doll. What’s Great About It – I did not put many dolls on this list, but this doll caught my attention. She is a very cute and well-crafted doll. She also has a detailed and intriguing personality that your daughter can build upon when playing make-believe. Imagination will take center stage with this gift, but sometimes that’s the best gift of all. 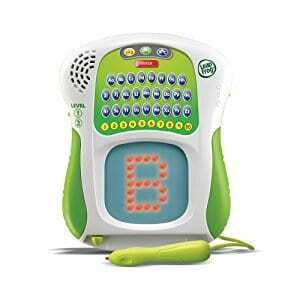 The LeapFrog Scribble and Write is not a make-believe toy. If your child has shown any interest in writing it does not need to be. The Scribble and Write can help your daughter practice letters and numbers with audio feedback. The Scribble and Write has a keypad with the alphabet A-Z and numbers 1-10. To learn how to write a letter or number, your daughter will press the corresponding key. A lighted prompt will show her how to trace the letter or number. And the audio feedback will let her know how well she did. There are different levels of writing from scribbling on the trace pad for younger children to unprompted aid for older children to practice. The Scribble and Write also tracks proper stroke order. The special stylus is designed to promote proper finger placement and control of a writing utensil. What’s Great About It – This is a great toy for your daughter to practice her writing skills. The automatic feedback helps her stay engaged. The special stylus will help with muscle memory and control. It is also small enough to be portable. She can bring it along when you know there will be long periods of waiting. This way she will be entertained and practicing the writing skills she needs. 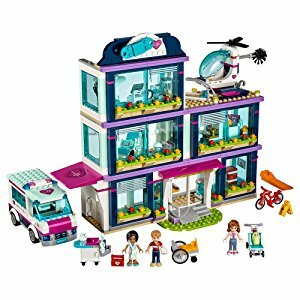 Your budding doctor can create her own hospital with LEGO Friends Heartlake Hospital. This may be a great option for you if your daughter enjoys both building things and role-playing. She can create her own hospital with the 3-level building module. The Heartlake Hospital comes complete with helicopter, ambulance, nursery, and emergency room for your little doctor to tend to her patients. The Lego characters are buildable. She can mix and match clothing and body parts to personalize them as she wishes. The set also includes various accessories so that she can create different stories. What’s Great About It – Like many Lego kits, the Heartlake Hospital can be combined with other sets to create new and interesting stories. 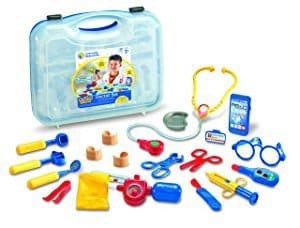 This set will help your child role-play as a caregiver and foster nurturing others. The building aspect will exercise fine motor skills and stretch her imagination. 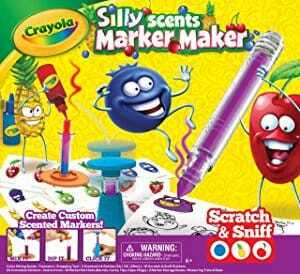 Crayola Silly Scents Marker Maker is more than just another coloring set. If your daughter enjoys creating things and coloring, consider this as a gift. Silly Scents contains everything she will need to make 16 markers. Your child will create her favorites or experiment with new color combinations to make her markers. Silly Scents comes with 3 different color fruit-scented inks. A color mixing guide is included to guide her mixing attempts. Light supervision may be needed when pouring the ink and assembling the markers. What’s Great About It – This seems like a great way for your daughter to take ownership of her coloring tools. She will create what she wants to use, giving her some control of her creations. Fine motor skills will also be honed as she mixes and puts her markers together. Imagination and creativity will also be utilized as she dreams up what she wants to make and how to use it. Is your daughter a pet lover and a Disney princess fan? If so, this gift idea is worth consideration. The LEGO Disney Whisker Haven Tales with the Palace Pets combines Disney princess pets with a Lego castle is great for hours of make-believe. Your child can play with 2 different Disney princess pets. One is the pink Princess Aurora’s cat, Dreamy. And the other is Pocahontas’ blue raccoon, Wildflower. 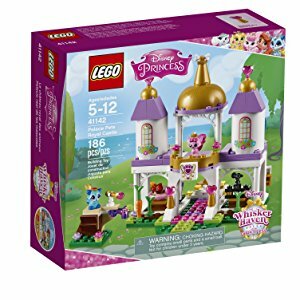 Your daughter can construct her 2-level palace that includes many different rooms, such as a revolving dance floor, dining room, and garden lookout. What’s Great About It – This palace playset has all the benefits of the larger play palaces without the bulk. Your daughter can play make-believe with her princess pets. Or re-build the Lego palace as much as her imagination urges her. The small pieces help her fine motor skills. Her palace can be re-designed as many times as she desires. And discovering each little detail of the set can keep her engaged for hours. Your 5-year-old daughter lives in a world full of magic. She is on the cusp between the unknown of infancy and the knowledge of school age. She is better able to distinguish between fantasy and reality, but still prefers make-believe and fairytales. Her language skills are also growing. Your child’s world is full of stories. Stories she can listen to, stories she can repeat, and best of all, stories she can create. One part of encouraging her developing language skills is giving her opportunities to role-play. These make-believe moments help her make sense of relationships to objects in the world. Socially, she is more interested in her friends and in pleasing them. Playdates grow increasingly more important to her. She is more affectionate and is starting to develop a sense of humor. Silly things will make her giggle. The frequency of emotional outbursts will slowly dissipate. Her fine motor skills are increasing as well. By this age, she can copy geometric shapes and draw some letters from the alphabet. Increasing opportunities to practice fine motor skills during playtime will also give an advantage to mastering other tasks that require similar skills. When I curated this list, I chose gifts that were developmentally relevant to her age. But, I also considered the make-believe aspect. Since role-playing and telling stories is an important aspect of her life, I chose gifts that will allow her to do so while learning. Learning aspects in playtime will continue to grow. But creativity and imagination can flounder if not nourished during this important time in her growth. She will be in her magical world for a short time. It should be filled with as much wonder as she can find. Your daughter sees the world around her as new stories to be discovered. Expand her perception by carefully picking out toys that will spark new interests. The magic that she sees in the world will be reflected in the new stories she plays out. As her possibilities grow, so does her enthusiasm to search for more.